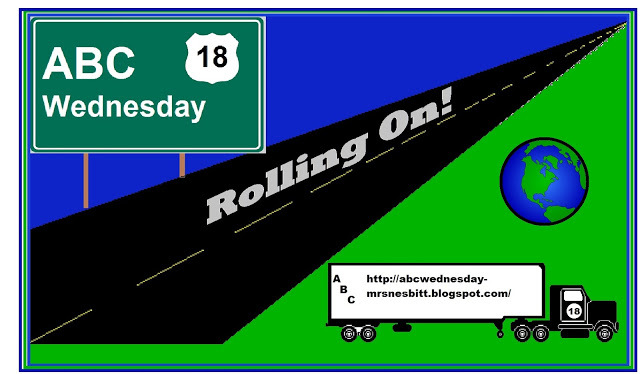 We are nearing the end of this round of ABC Wednesday - and it has been most enjoyable. 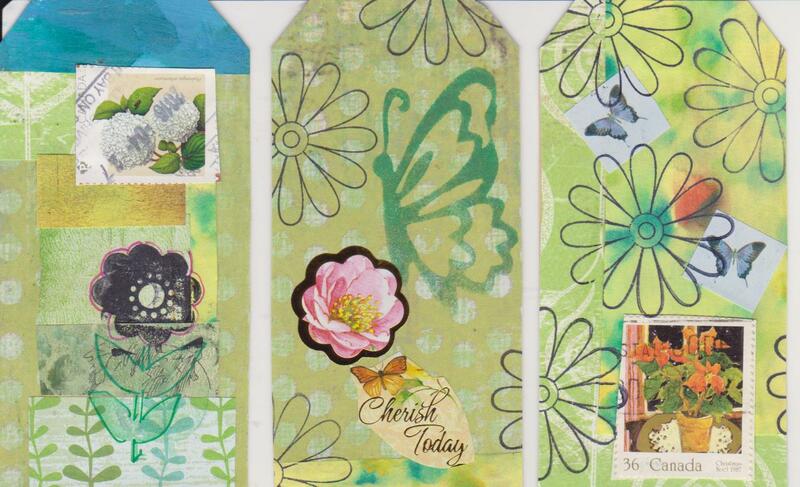 Here is my carved stamp and art tag for U - even able to use my raindrops stamp for the tag. 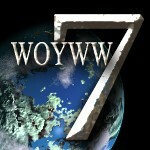 Be sure to visit here to see what others around the world did for U. 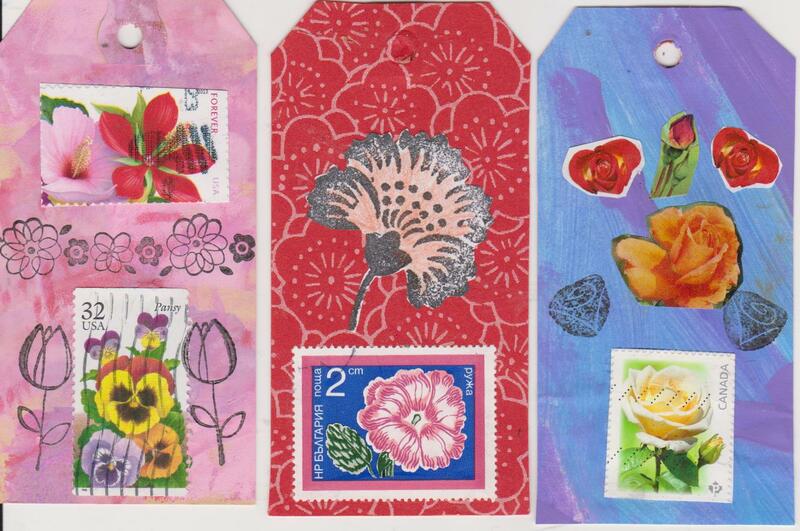 Each week Julia Dunnit encourages us to share our workspaces and what we are creating at her blog "Stamping Ground" for the fun challenge WOYWW. Here's my workspace on my dining room table after I carved the umbrella stamp. Here are a few things I worked on this past week. THis time, instead of printing out the quote, I wrote the words myself, using India ink. Something I need to work on. 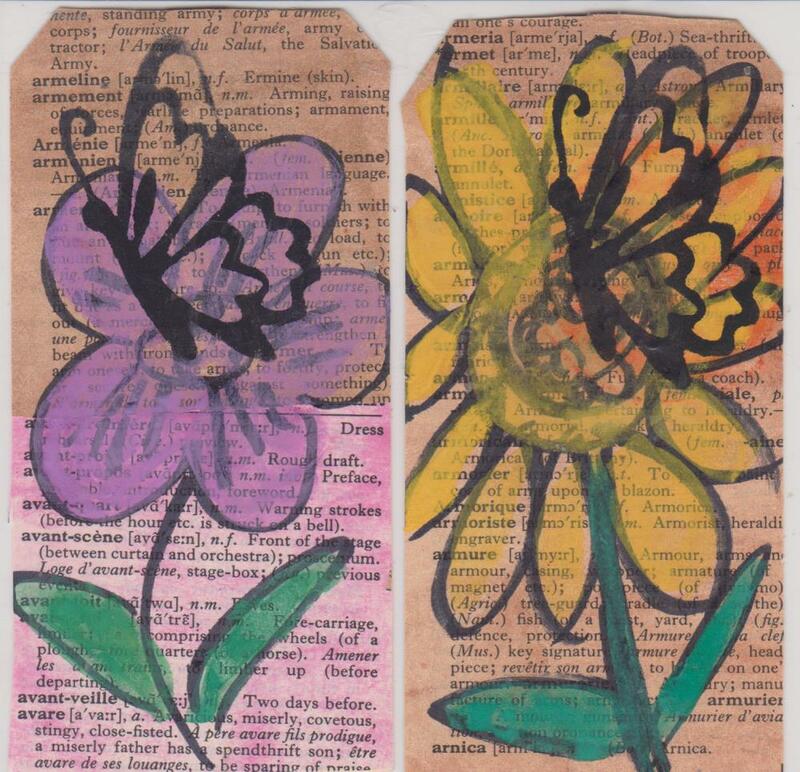 I also used a new stencil - I got the hang of it by the time I did the second on the right. 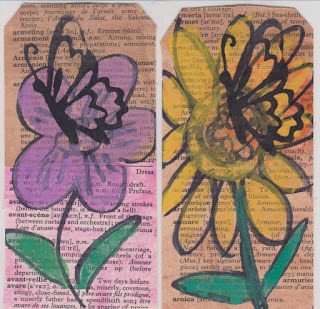 I did a few more this week, on the flower theme, trying to use up some supplies and using similar items. And of course - photos! The flowers are beginning to bloom and they are so beautiful. Here's a few from our gardens. This week at ABC Wednesday - T gets the nod. Here is my carved stamp and art tag for turtle. I ended up creating a second tag as the first was too dark to showcase the turtle. 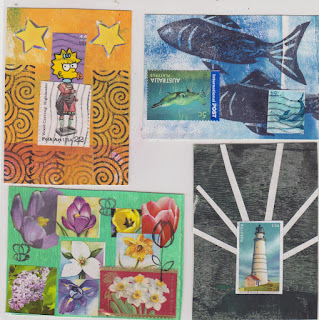 Be sure to check here to see what others did for T.
Each week at "Stamping Grounds", Julia Dunnit hosts WOYWW - where we are all encouraged to share what we are working on and the state of our workspaces. First I have to share just how clean I got my craft room workspace last week. I needed to reorganize and clean off the table, as well as the shelves to the far left. There's still more to do in the room but it feels good to start fres. Today though, I was working upstairs at the dining room table to create the stamp and tag. I may just squeak this in before midnight! It has been a busy day with gardening - such a lovely day to fill pots and plant. I had hoped to take photos - but my batteries died and will have to do that tomorrow. The first is a totally decluttered and tidy workspace! I am in the process of reorganizing my craft room and the table had to be redone. Because of this I did not create a much as I would have liked this week. This weekly challenge is more than just creating a journal page - it is an exploration of a theme, a quote, a positive view of life. 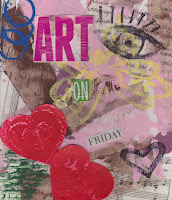 as well as the carved stamp and tag I created for ABC Wednesday. Once again, it's time to share what we have chosen for the letter of the week for ABC Wednesday. Be sure to check here for what others around the world did with S.
Once again, here is my carving station - on my dining room table. It is that time of the week to share some of the art I have been creating this week. 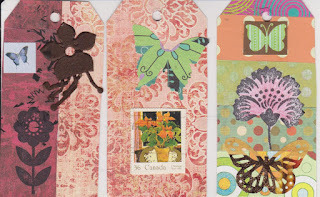 My 356 day challenge for myself continues - with creating art tags on the theme of "Blooms and Butterflies" for the May challenge at MMMC. 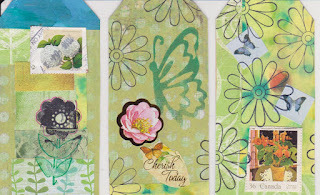 I also created a tag for the ABC Wednesday challenge - r is for raindrops. The weekly challenge at LuLu Art continues with a focus on "wonder". I used my own photos as a backdrop for the quote. 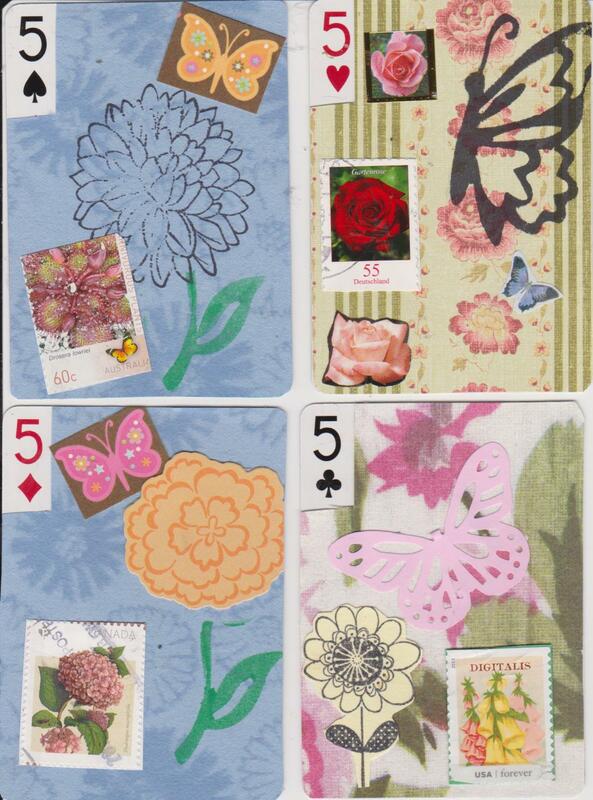 I created one set of APCs for a swap -with the theme of flowers and butterflies as well. The flowers are blooming so of course I had to take a few photos of them this week. R is for raindrops - a must for growing flowers. Here is the stamp I carved and the tag I created. Be sure to check here to see what others did for R this week. Each week, Julia Dunnit encourages us to share our workspaces and what we are working on for WOYWW, hosted at her blog "Stamping Ground". Here is my dining room table after I carved the stamp and tested it in my small journal. Loved the colour of the ink I bought a while ago and never used. 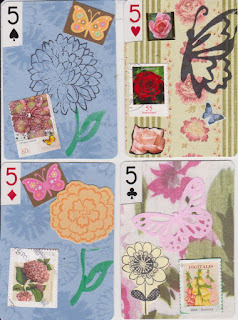 Here is the same spot after I finished the card. What was missed? The spolled water after I painted the tag with some watercolour and the pile of papers to the left! It's been over a week since the A to Z April Challenge ended. And yes - I completed it. Some days I was rushing at midnight to complete a post, but I did one for every letter. Yeah!!!! It was a challenge yes, but a most enjoyable one. Here's my reflection for the challenge. My major learning ~ be sure you post your correct blog address when you sign up - or in my case - use the blog you used to post to sign up! You may get more visitors! The challenge allowed me to be creative artistically every day and I now have over 40 quote cards to refer to for inspiration. In the end ~ it was positive experience and I would definitely do it again. I would also recommend that others try it next year. Thanks to the A to Z team for another wonderful experience! 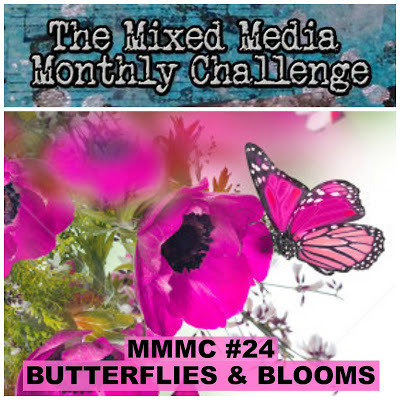 This month's theme at MMMC is "Butterflies and Blooms" - a great theme for May. 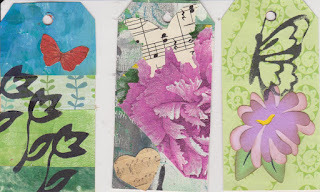 This week the theme is "Balance" for the challenge at "LuLuArt"
In addition to the flower tags above, I also created a "question" tag for ABC Wednesday. This week at ABC Wednesday, Q is the letter of the week. Here is the carved stamp and art tag for Q. 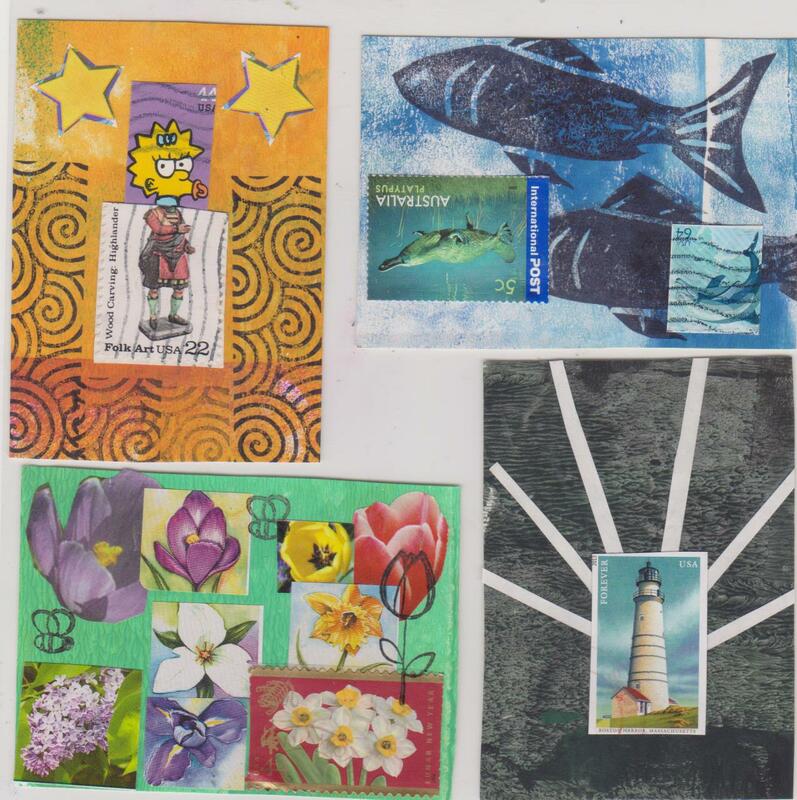 Each week, Julia Dunnit of "Stamping Ground" hosts a fun meme - WOYWW - where we are encouraged to share what our workspaces look like and what we are working on. Here is my stamp carving station - on my dining room table. It doesn't take too many tools, and is actually quite relaxing. Once again tho, I had to redo the stamp as I drew it on the "right way", but realized it would have been backwards when I stamped it. At least I hadn't gotten too far!